If you’ve never considered yourself a sprout lover, Jim and Corie Brooks might just prove you wrong. “For anyone who says they don’t like sprouts, 99 percent of the time I can find at least one that they do,” says Jim. From wheatgrass and bean sprouts to baby arugula and cilantro, the husband-and-wife team grows nearly 40 varieties of sprouts and microgreens at Brooks and Daughters, their five-acre farm in Forestville. Jim, a fifth-generation cheesemaker, and Corie, a former food scientist, have deep roots in the food world. In the 1990s, when Jim’s family business closed and Corie became disillusioned with corporate work, they decided to blaze a new trail by growing sprouts commercially. “We looked around the farmers markets in northern California, and there really wasn’t a sprouts presence at all,” says Jim. After getting a crash course in the sprouts business from Jim’s cousins in Santa Barbara, the Brooks duo started selling sprouts in farmers markets in 1996. Sixteen years later, the couple still does most of the growing, processing, and marketing themselves, but now the two daughters for whom the company was named, Geneva and Lindsay, also chip in. Brooks and Daughters sells over 95 percent of their product directly to customers through five farmers markets around the Bay Area. Devotees of sprouts attest to the benefits of eating certain grains, greens, and legumes in their immature state. “A lot of flavor, vitamins, and minerals that are going to be in the plant are concentrated in the sprouts,” Corie notes. But ironically, sprouts sometimes get a bad rap for being associated with “sproutbreaks” of foodborne illness that have occurred at numerous large-scale sprouting operations. With at least 30 reported outbreaks since 1996, sprouts made headlines most recently when the FDA launched the Sprouts Safety Alliance to help sprouters identify best practices in this tricky growing business. If sprouts are the infants of the produce world, microgreens are the youngsters. 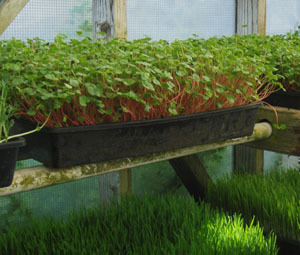 Whereas sprouts can reach their prime in just a few days, microgreens are grown for up to five weeks. And microgreens are cut off at the stem when purchased, instead of being sold roots and all, as sprouts are. Microgreens must also be grown in a nutrient-rich substrate, which, at Brooks and Daughters, consists solely of homemade organic compost. 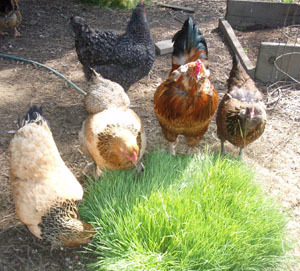 Because their product is raised to be at its peak for each market, any unsold leftovers go to their chickens and guinea hens, which in turn contribute to their compost pile. “Everything goes around in a big circle,” says Corie. You’ll find plenty of microgreens and sprouted nuts and seeds at their booth year round, but, because the family prefers to keep their operation low-tech, some items are only available seasonally. “We could grow sunflower microgreens in the winter, but we would have to put all this energy into it,” says Corie. “It just seems wasteful.” The Brooks family start the seeds on racks in unheated greenhouses and carefully manages the growing conditions using shade cloths and passive solar instead of artificial heat and light. Though they haven’t been certified organic since 2004, when the USDA’s process became too costly for their small operation, Corie and Jim are committed to using environmentally responsible methods. The greatest input and expenditure is sourcing fresh, clean organic seed. “People assume we also grow the seeds, but it takes acres and acres to produce all the seeds we use,” Jim points out. Most of their seeds come from North American suppliers that specialize in organic seeds for sprouting. Helping eaters understand the ins and outs of growing, storing, and eating their product requires a bit of education, Jim and Corie note. Sprouts and microgreens are best eaten raw, as they lose their vitality, as well as precious water-soluble vitamins and enzymes, when cooked. 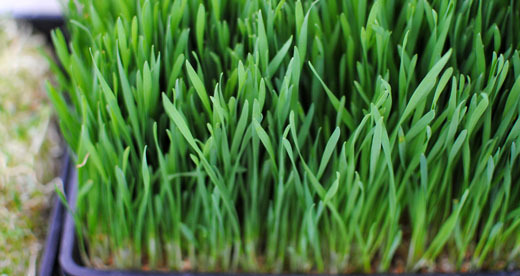 The delicate greens should be stored in a dry, airtight container with a paper towel and always refrigerated. According to Jim, they’re best consumed within two to four days of purchase; when stored well, they can last for up to a week. You can find Brooks and Daughters at the Saturday market in the back plaza. 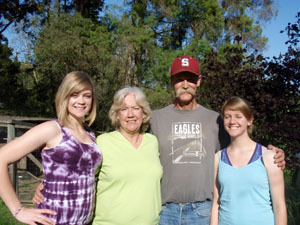 Photos courtesy of Brooks and Daughters.